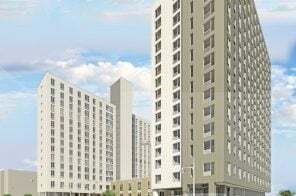 Long in the works, construction at the Pacific Park complex in Brooklyn is set to ramp up after Greenland Forest City Partners announced a partnership with the Brodsky Organization to develop 18 Sixth Avenue. Designed by Perkins Eastman, the building will exceed 500 feet and become the tallest in Pacific Park. As 6sqft previously reported, Brodsky was also tapped for another apartment building in the complex at 664 Pacific Street, which will also include public space and a school. Groundbreaking at both sites is set to take place within the next two weeks. The development of Pacific Park, a 22-acre mixed-use complex near the Barclays Center, has entered its next phase Greenland Forest City Partners announced Wednesday. The developer is bringing on TF Cornerstone and the Brodsky Organization as development partners for the project. The duo will develop three parcels at the site, which include three rental buildings, a new public school, and new open space. Greenland also announced construction is set to begin in the spring for the park’s tallest tower, a more than 500-foot tall tower designed by Perkins Eastman. As a solution to Manhattan’s growing gridlock, planning and design firm Perkins Eastman is proposing a physical redesign of New York City’s street grid. 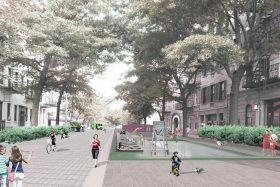 In a CityLab article penned by Jonathan Cohn, who leads the firm’s transportation and public infrastructure studio, and Yunyue Chen, the recipient of Perkin Eastman’s 2017 Architectural Fellowship for the Public Realm, they argue the city should “transform the streets radically, dedicating them to pedestrians.” This includes grouping blocks into larger neighborhoods and organizing them into either thoroughfares and local streets. New renderings have been unveiled of Dock 72, a 675,000-square-foot office building co-developed by Boston Properties and Rudin Management for the evolving Brooklyn Navy Yard. Surrounded by water on all sides but one, Dock 72, designed by S9 Architecture, features outdoor terraces, 35,000 square feet of amenities and unobstructed views of Manhattan. 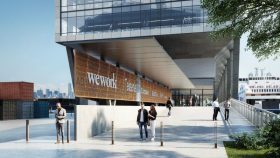 As the anchor tenant and co-developer, WeWork will occupy a third of the space, or 220,000 square feet. 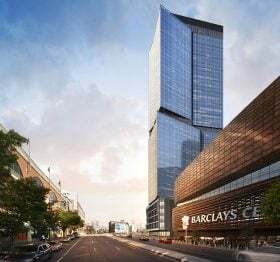 With its glassy facade installed, the 16-story office building is scheduled to wrap up construction in the fall, becoming one of the largest ground-up office buildings in the borough in nearly three decades. The transformation of the Brooklyn Navy Yard from a warship building site into an industrial tech-hub got an extra boost this week after a non-profit announced a $2.5 billion building plan that would quadruple its current workforce. 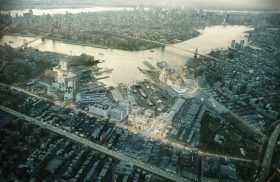 As Bloomberg first reported, the Brooklyn Navy Yard Development Corporation, which serves as the site’s property manager on behalf of the city, plans to add 5.1 million square feet of manufacturing space to the site, with a little over half of it going towards one large complex. With New York City’s population on its way to nine million, the city’s infrastructure may be impressive, but it has its limits–including red tape and resource shortages–that will make it difficult to withstand the projected surge. Reminding us of the transformative innovations of Robert Moses–he of the big ideas and ego to match–Crains invited 12 firms who make their living wrangling infrastructure to hit us with some big ideas. 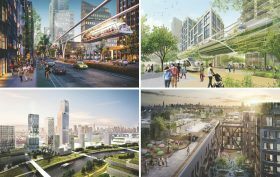 Ahead of the upcoming summit, “Getting Ready for 9 Million New Yorkers,” they’ve shared these visions for future (bigger, better) New York from top architects, designers and real estate experts. Ideas include some that have already proven themselves (repurposing existing track beds) and some already in the works (Bushwick’s Rheingold brewery project) to others that Robert Moses might not love (shrinking the city’s highways). Take a look at these futuristic ideas for moving the city forward. 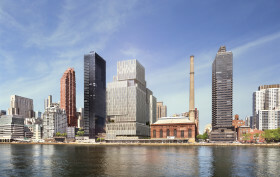 On a far-eastern block of the Upper East Side’s Lenox Hill neighborhood, a unique venture is underway to build new facilities for Hunter College and Memorial Sloan-Kettering Cancer Center. Now wrapping up its cavernous foundations, the 1.15 million-square-foot development will accommodate two separate towers: an East River-facing building that will house a 730,000-square-foot, 23-story outpatient treatment center for Memorial Sloan-Kettering; and a slightly smaller, 400,000-square-foot mid-block building for CUNY-Hunter College’s schools of nursing and physical therapy. Hunter will trade its current nursing school facility at First Avenue and East 25th Street to the city where they will build a new sanitation facility. 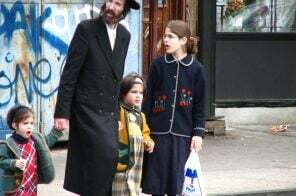 In 2012, then-mayor Michael Bloomberg awarded the institutions the right to to build upon the half-block parcel fronting the FDR Drive between East 73rd and 74th Streets. The site was previously home to a sanitation facility that was demolished in 2008 and was sold to the college-hospital for $226 million. 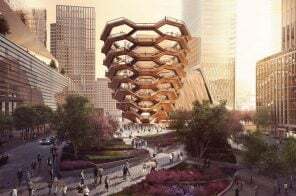 The mammoth, 455-foot-tall structure is being designed by Perkins Eastman in collaboration with Ennead Architects and required special approvals to rise more than the as-of-right floor area and height limit. Aside from the project’s size, neighbors took issue with the project’s shortfall of parking spaces and the resulting congestion of a community loaded with medical facilities. The City Breaks Ground on New York’s 630-Foot Ferris Wheel Tomorrow! Hold on to your hats, folks! After countless delays, the New York Wheel is finally back on track. Architizer reports that workers are gearing up to break ground tomorrow, April 16th, on what is slated to become the world’s tallest observation wheel. 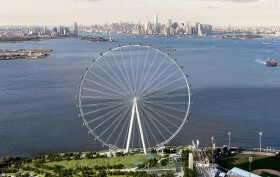 Providing panoramic views of New York Harbor and the cityscape beyond, the 630-foot wheel located at the tip of St. George on northern Staten Island is primed to become one of the most epic ways to experience New York City.